Completely redesigned for 2017, the Audi Q7 has morphed into a truly outstanding 7-passenger SUV. Sleeker, roomier and more stylish than before, its aluminum-intensive architecture cuts curb weight by nearly 500 pounds for better performance and fuel efficiency while a new suspension improves ride and handling. A potent supercharged V6 matched with Audi's Quattro all-wheel drive rounds out the mix. Audi symbol of luxury. New q7 makes driving experience comfortable and smarter. Sturdy and comfortable vehicle not very luxurious but with the basic comforts. Good driving experience. It can be better by adding hi tech facilities related to safety and luxury combined. It should have the basic facility of tph. It has a good suspension for a comfortable ride, trunk space is reasonably good. This is a very comfortable car. It is one of the most quiet SUVs on the road. It makes good gas mileage and aside from a few problems with the steering column at the beginning, we haven't had any problems with it. It is easy to drive and looks great. My car is a premium ride at a premium cost. Although the car is expensive, it seems to match the value. My Audi is very comfortable to ride in. My car also has a beautiful and refined interior. I love that my family can fit comfortably and we still have room for luggage. My only complaint is that sometimes Apple Carplay gets wonky with my iPhone. 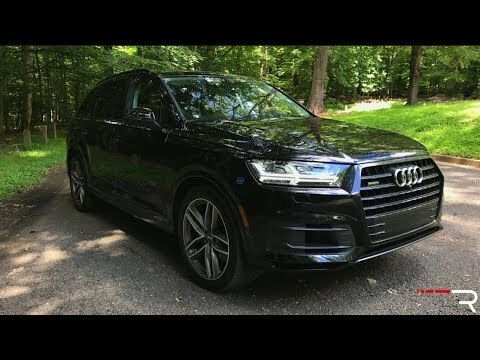 Why You SHOULD NOT Buy A 2017 Audi Q7! If the third row seat does not remain in its adjusted position, there may be an increased risk of injury to an occupant in the event of a crash. Audi will notify owners, and dealers will install an additional support bracket to the seat, free of charge. The recall is expected to begin in November 2016. Owners may contact Audi customer service at 1-800-253-2834. Volkswagen's number for this recall is 72F8. Volkswagen Group of America, Inc. (Volkswagen) is recalling certain model year 2017 Audi Q7 vehicles manufactured November 11, 2015, to November 23, 2015. In the affected vehicles, the electric power steering assist control unit may short circuit resulting in a loss of power steering assist. Audi will notify owners, and dealers will replace the steering rack, free of charge. The recall began November 2016. Owners may contact Audi customer service at 1-800-822-2834. Volkswagen's number for this recall is 48M5. Volkswagen Group of America, Inc. (Volkswagen) is recalling certain 2017 Audi Q7 vehicles manufactured August 30, 2015, to May 8, 2016. Due to a software issue within the air bag control module, the frontal air bags may deploy with more force than required in certain crashes. As such, these vehicles fail to comply with the requirements of Federal Motor Vehicle Safety Standard (FMVSS) number 208, "Occupant Crash Protection." Air bags that deploy with excessive force may increase the risk of injury. Volkswagen will notify owners, and dealers will update the air bag control module software, free of charge. The recall began September 2016. Owners may contact Audi customer service at 1-800-253-2834. Volkswagen's number for this recall is 69O3.